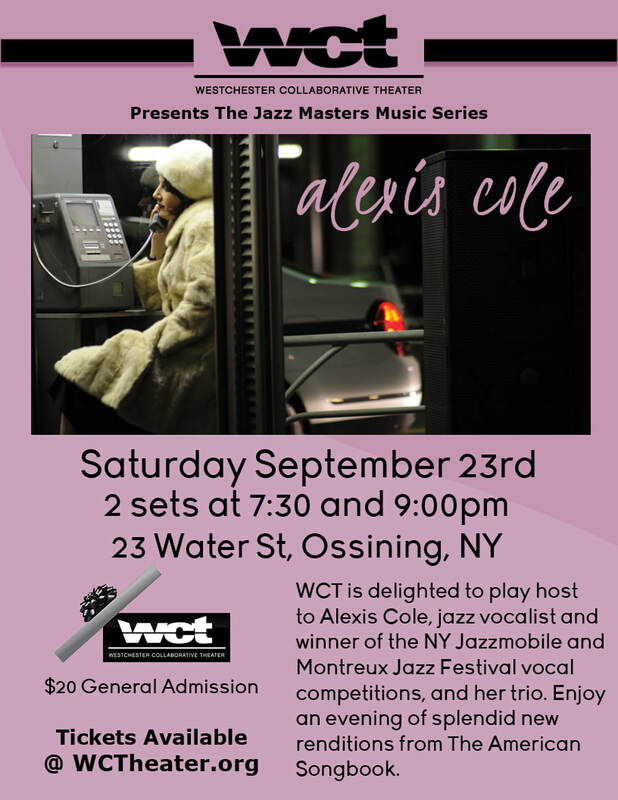 ​On Saturday, September 23rd, WCT continued its Jazz Masters music series with jazz vocalist Alexis Cole and her trio of musicians. Appearing for two sets; Cole, winner of the NY Jazzmobile and Montreux Jazz Festival vocal competitions offers up an evening of new renditions from The American Songbook. ​Called "one of the great voices of today," by Jonathan Schwartz, Alexis Cole has been compared to classic jazz singers such as Sarah Vaughan and Anita O'Day. She's performed with the Boston Pops and New York Philharmonic on stage at venues from Avery Fisher Hall to the Kennedy Center. She records for Motéma Music, NY, Chesky Records, NY and Venus Records, Japan. Cole is the recipient of a Swing Journal Gold Disk award, and was a winner of the NY Jazzmobile and Montreux Jazz Festival vocal competitions, and a finalist of the Sarah Vaughan Competition. Cole's nine recordings, which feature musical luminaries such as Fred Hersch, Eric Alexander, Matt Wilson, Harry Pickens, Don Braden and Pat LaBarbara, have received high praise in the jazz press and are spun on radio world-wide. In addition to her many performances on great stages, Alexis can be seen at top jazz venues like Dizzy's Club at Jazz at Lincoln Center, Birdland, The Jazz Standard, Blues Alley, and Billboard Live, Tokyo. Alexis studied voice and piano at the University of Miami and William Paterson University, and holds a Masters of Music from Queens College. She has also trained in Indian Classical singing at the Jazz India Vocal Institute in Mumbai. She heads the Jazz Voice Program at SUNY Purchase. She performs and conducts master classes around the world. Find out more about Alexis Cole on her website!